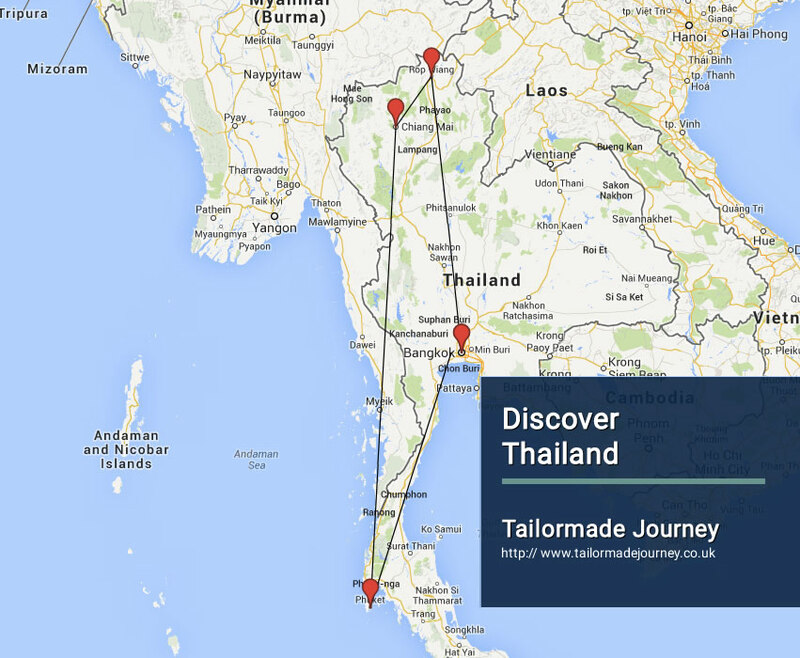 This tour showcases the three main Cities of Thailand. Land on the Capital City Bangkok exploring the lifestyle of this Metropolitan City and continue towards North to enrich the culture of Chiang Mai and in the End relax on the Beaches of Phuket. Arrive Bangkok 4 Nights > Flight Chiang Rai 2 Nights > Drive Chiang Mai 4 Nights > Flight Phuket 3 Nights > Flight Bangkok & Leave. Overnight Stay at the Hotel in Bangkok. Awake early to witness the serene morning chants of the monks at famed Wat Po, an incredible start to the day. Tour the temple grounds and explore the grandeur and majesty of the nearby Grand Palace. After lunch, continue to Chinatown and absorb the vibrant street atmosphere with a walking tour followed by a longtail boat trip through the winding city canals. Today full day excursion to the countryside. Less than two hours from the capital you will discover unusual markets on the train tracks and take a paddleboat through an authentic floating market. Encounter friendly local and taste local delicacies along the way, making for an unforgettable day out. Proceed to King Rama II Memorial Park which houses a Thai style pavilion museum displaying artefacts from the early Rattanakosin era and a landscaped garden filled with native flowers. Absorb centuries of Thai history today as you travel by local train to the former capital of Ayutthaya. Spend this morning among the magnificent ancient ruins of the city with an expert guide and this afternoon exploring nearby markets and the royal palace of Bang Pa In. Timed to perfection, you will miss the tourist crowds and enjoy the sights of this fabulous city at your own pace. Overnight Stay at the Hotel in Bangkok. Overnight Stay at the Hotel in Chiang Rai. Morning Free In the afternoon, experience a cruise down the majestic Mekong river onboard a traditional longboat – “007” style enroute to the Golden Triangle where Thailand, Myanmar (Burma) and Laos come together. Once you are through with the Golden Triangle board a Songtaew followed by a Tuk Tuk to visit a local market and an ancient temple called “Chedi Luang”. Then returns to the resort for relax. Today you leave for Chiang Mai. Stop a visit to Wat Rong Khun, also known as the White Temple. Coffee break on the way at the excellent Jarin Garden Resort famous for its homemade pies, or coffee break at Cabbage & Condoms operated by the Population and Community Development Association to serve and assist the rural people. And also be made at Mae Krachan hotsprings before arriving in Chiang Mai. Overnight Stay at the Hotel in Chiang Mai. Drive north through the hilly, wooden area on the outskirts of Chiang Mai to the Chiang Dao elephant camp for elephant riding and a bamboo raft journey down the Ping River. After lunch amid the lush scenery, continue to Chiang Dao area where you visit Palaung, Akha and Lisu tribal villages and learn about their traditional lifestyles. Return to Chiang Mai late this afternoon. Today discover the hidden treasures of Chiang Mai. Take a trishaw to a local market, purchase a selection of offerings and head to a temple for an offering ceremony with Buddhist monks. Afterwards, head to Wiang Kum Kam, a lost civilization buried under layers of earth, and explore by bike. Return to Chiang Mai to visit the local cultural hall which chronicles the town’s history. Overnight Stay at the Hotel in Chiang Mai . Today full day excursion to Mae Kampong. Join the villagers for a walk through the area and surrounding forest, stopping at the tea and coffee fields en route. Prepare lunch and dine alongside a family in their house, followed by a traditional Thai massage to help you relax. Before returning to Chiang Mai, there is more time in Mae Kampong to discover other aspects of the rural lifestyle. Overnight Stay at the Hotel in Phuket. Day at Leisure on the Beach Overnight Stay at the Hotel in Phuket. Today you are transferred to Phuket Airport to board flight for Bangkok. Upon arrival in Bangkok Airport you connect Flight for Onward Journey. Novotel Phuket Kata Avista Resort and Spa is located on Kata Beach and is 3 minutes walk from the beach. Novotel Phuket Kata Avista Resort and Spa is set among green hills and offers sweeping sea views. The luxurious accommodation features spacious rooms with a balcony or terrace. The stylish rooms at Novotel Phuket Kata Avista overlook the sea, pool or garden. A DVD player with flat-screen television provides an easy way to unwind. Guests can enjoy a massage and body treatment at Sukko Spa or have a relaxing swim in the infinity pool. Kids can play at the Kids Club while adults take it easy at the putting green or go on a hiking adventure. Fresh seafood, Thai, Asian and international dishes are served at the Avista's cafe. An extensive beverage list is available at the Wine Lounge. Room service and a breakfast buffet are offered. Holiday Inn Chiangmai hotel offers views of the Mae Ping River and Doi Suthep Mountain, just a 5-minute drive from Chiang Mai City’s famous Night Bazaar and temples. It houses 4 dining options and an outdoor pool. Free shuttle service to Night Bazaar and Weekend Walking Streets. Holiday Inn Chiangmai Hotel’s spacious rooms feature a seating area. They include flat-screen TV with cable channels and tea/coffee making facilities. Offering a modern décor, the private bathrooms come with a bathtub. Holiday Inn is a 10-minute drive from Chiang Mai International Airport and is within a 30-minute drive of 5 golf clubs, including Chiangmai Lamphun Golf Club. Borsang Village is 10 km away. Guests can relax in the sauna or exercise in the gym. Other facilities include a business centre and a tour desk. Room service is also provided. Serving Thai and international favourites, River Terrace offers a choice of indoor or outdoor dining. China Palace features Dim Sum menu and Shabu Shabu buffet. Shangri-La Hotel offers luxurious accommodation with free wired internet in culturally-rich Chiang Mai, just 10 minutes' drive from Chiang Mai International Airport. A free-form pool and spa are available. Reflecting comfort and elegance, air-conditioned rooms feature beautiful Northern Thai decor and charm. Each comes with a flat-screen TV, DVD player and minibar. A pillow menu and feather duvets are also included. Shangri-La Hotel, Chiang Mai is about 1.5 km from the famous Night Bazaar, Tha Pae Gate and Sunday Walking Street. It is about 2 km from Chiang Mai Railway Station. The hotel's signature CHI, The Spa provides private spa suites and relaxing beauty treatments. Guests can also exercise at the fitness centre, enjoy a game of tennis or arrange day trips at the tour desk. Kad Kafe serves a selection of international dishes and a buffet breakfast spread. Drinks can be enjoyed at the Pool Bar, Lobby Bar and Silapa Thai Lounge. The hotel can also arrange vegetarian and Halal meals. RatiLanna Riverside Spa Resort boasts well-appointed rooms and beautiful views of Chiang Mai’s Mae Ping River. It features 4 dining options, a spa, and an infinity pool spanning 480 m². The elegant rooms at RatiLanna Riverside combine wooden furnishings and Thai décor. Each room has a flat-screen TV with home theatre system and DVD player. The bathroom features a flat-screen TV mounted by the bathtub, and a separate rain shower stall. Guests can exercise in the fitness centre, or enjoy quiet reading in the library lounge. The resort also offers Thai cooking classes and tour arrangements. It has a gift shop and a business centre. Mira Terrace Restaurant offers indoor or outdoor dining. Buffet and barbecue dinners are offered at Rio Restaurant & Bar. Drinks can be enjoyed at the swim-up Dips and Sips bar or at Malin Pavilion. RatiLanna Riverside Spa Resort is only 10 minutes away by car from Chiang Mai International Airport. Le Meridien in Chiang Rai is surrounded by mountains, historic Buddhist temples and hill tribe villages. Its two-level outdoor pool overlooks the magnificent Mae Kok River, while its spa provides pampering massage treatments. Fitted with free Wi-Fi in all room types, elegant rooms have a large balcony and sofa bed which enjoy beautiful views of the tropical greenery or river. All come with a DVD player, flat-screen TV and free daily newspapers. Attached bathrooms include a separate bathtub and hot-water shower stalls. Le Meridien Chiang Rai Resort is 3 km from Chiang Rai Night Market and 10 km from the Hill Tribe Museum. It is a 15-minute drive from Chiang Rai Airport. Parvati Spa provides relaxing oil therapies and serves herbal drinks in its classy treatment rooms. Guests enjoy free access to the 24-hour gym. River House Resort & Spa, Chiang Rai boasts a privileged location on the banks of the River Kok. Its luxurious rooms offer views over the river or outdoor swimming pool, as well as free WiFi access. Rooms at River House Resort provide stylish furniture, fresh white walls and wooden floors. Each room provides a 25” flat-screen TV with cable and satellite channels. Rooms are also equipped with tea and coffee makers and bathroom toiletries. As well as relaxing in the large outdoor swimming pool that overlooks the river, guests can enjoy the spa pool and well-equipped fitness centre. At the spa and wellness centre, a range of beauty treatments are on offer, as well as relaxing massage therapies. River House Resort and Spa is just 15 minutes’ drive from Chiang Rai Airport. Shangri-La Hotel Bangkok boasts a 10,000-sqm Fitness Centre and the multi-awarded CHI, The Spa at Shangri-La. Among its 10 dining options is an award-winning restaurant. Guests can join daily aerobics and dance classes at the hotel, or play a game of tennis. Shangri-La Bangkok also has a spa pool, sauna and steam room. Other facilities include a shopping arcade, a clinic and a business centre. Offering city or river views, rooms at the Shangri-La feature Thai décor with silk and wood furnishings. Each room is equipped with a flat-screen satellite TV, a safety deposit box, and a minibar. Authentic modern Italian dishes are served at Volti Ristorante & Bar where guests can enjoy its live music and at-home luxury atmosphere . For a romantic dining experience, Horizon II River Cruise serves an Asian and international buffet on a private riverboat. The Chocolate Boutique offers an indulgent range of sweets and hot drinks.